At the October 19, 1954 meeting of the Lyons Civic Club, a movement was launched to establish a public library for the village of Lyons. Public meetings were then held to gain the interest and support of the general public. A vote was held on May 3, 1955 and the voters of the Lyons School District approved the establishment of a public library for Lyons. On June 24, 1955 the Board of Regents granted a provisional charter to the Lyons School District Public Library; the absolute charter was granted on September 30, 1960. 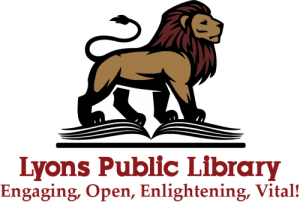 In January 1956, the Lyons Public Library officially opened its doors to the public. The new library was located in the Darling House, next to the Lyons Elementary School and Mrs. Doris Dixon was the librarian. Over the years the library’s growth continued and in January 1967, the library moved to the corner of Phelps & Canal Street in the Eureka Grange building. The Library moved to its current location at 122 Broad Street in April 2008. This is the site of the former Lyons Community Hospital, part of which was renovated for use and a large new addition added on the back.